Our low cost French Horn rental scheme is designed to get you started with the best possible instrument so playing is easier and more fun! When you rent a Yamaha french horn, you get a case, rotor oil, slide grease; in fact everything you need to get started. We even get our Brass Repairs workshop to check everything fully and play test the instrument before it comes to you. When starting any musical instrument you need a quality piece of kit to help you progress, a poor quality instrument can really cause an obstruction to progress. 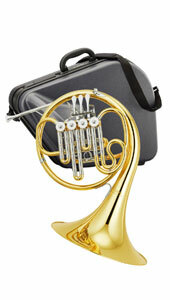 The French Horns we rent are all quality Instruments which have been checked by our Workshop.